We are a small company located in Thompson, Ohio USA. (If you are ordering from Ohio you will be charged sales tax at the rate for your zip code along with your shipping charges.) John and Cathy have been around since 1985 full time seeing many customers at Gun Shows. Caleb, our son joined us in the business back in 2006. So That makes us J and C Sales. No play on anyone elses name just our own! Due to the nature of the industry all prices are subject to change without notice. Our internet prices and our gun show prices may not match. If our internet price is less please don't ask us to honor it at a show. At the show we have to factor in fuel prices, tables, food etc. etc. We believe in giving you, our customer, good quality for your hard earned money. We don't like misfires or misrepresented goods anymore than you do. But we all have to remember we sell surplus ammunition and original military surplus. We will always give you the straight info on our goods but since we didn't make it we won't make any guarantee. All warranty if any will be from the importer or original manufacturer. We're only human here so if there are any typographical errors we'll correct them as soon as we find them. Sorry we won't over charge you or under charge us. Thank you for your cooperation in this. Times are changing quickly on us and we are doing our best to keep up. We do not have our inventory hooked to a data base so when we run out we will notify you that your order is canceled. We do not charge your card until we can process your order. When you call; I could be at the office, the shop or in the warehouse or driving so I will do my best to give you accurate information. I ship all orders that I have on Tuesdays and some Thursdays (schedual permitting). Please be aware that we are not doing business face to face so I can't see that you are over 21, so please forward a COPY of your state issued ID (driver's license) if you want ammunition or magazines from us. You only need to do this once for us and Thank you for understanding. If you are for some reason giving me different addresses for billing and mailing please add a note as to why (like you're military if appropriate). This is just to clear up any possible fraud issues. Also WE CAN ONLY SHIP TO YOUR FOID ADDRESS WHEN SHIPPING to you in ILLINOIS. You can fax, Email or just mail it to us. Shipping I ship as I have time each week. We are a small business and still go to gun shows . I ship every week as much as I can get out the door. So please be patient. If you have ordered Ammunition make sure your ID in before you order, Other wise your order will be canceled. When Ordering From US Our CREDIT CARD company requires you sign for your package. If you can not sign DO NOT order from us. Yes this is because we are selling ammunition and magazines. And we have NO Choice in this. Attention Customers: The Laws are changing faster than humans can keep up! Please be kind to me when you call in. This is List has become a living thing; good one day and not the next. Please know what your Local Politicians are doing to you. California: NO magazines over 10 rounds to anyone in the state. NO ammunition . If you have question please contact your local authorities. Hawaii: Pistol magazines 10 rounds or less. Illinois: We must have both your F.O.I.D. card and Drivers License on file. We will only ship to the address on the F.O.I.D. card. Please make sure your information copies clearly. NO sales of ammo, mags or parts to Chicago or Cook county. New Jersey: NO magazines sales over 10 rounds. We must have your Firearms/Ammunition ID card and a photo copy of your driver's license on file Before you can order ammunition. You only need to do this before your first order. New York: NO ammunition or magazine sales.. Please refer to your local laws before placing an order. All orders that need ID (that would be for Magazines and Ammunition ) Must have Id on file Before you order. 1. A signed statement from you that you can legally purchase the items you order from us. You are responsible for knowing and obeying your local, state and federal laws as they apply to you. Please don't expect us to know your local laws. If you have questions contact your local authorities. We will not knowingly ship items that are prohibited in your area. Example High Capacity Mags to California or New York residents. 3. A Clear photo copy of your state issued photo ID clearly showing your date of birth. A driver's license works great! And remember if you can't read the copy we can't either! 3. Your signature that the information you are submitting is true and that you are complying with the law. Your signature also indicates that you authorize payment to J and C Sales via your credit card if that is your payment of choice. Sorry but shipping is billed to you on all orders. We bill the actual UPS/USPS charges for ground/residential shipments. We add a $2.00 processing fee to this. If you are buying ammunition the order will be sent "Signature Required" unless you specify otherwise! If we are shipping to an address other than the one for your ID we will ship with an adult signature required if we don't have an ID on file for that address. If you would like to know your shipping charges in advance please either call or Email us and we will gladly let you know. Warranties are from the Manufacturer or Importer only. But if you just don't like the item (other than ammo) you can still return it and we will refund your money for the item less 15% for restocking. Sorry but you will pay shipping charges to return it. 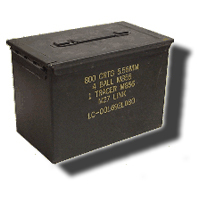 Remember the US Mail DOES NOT accept ammunition to ship.